(CNN) - To say Rand Paul is testing the 2016 waters would be an amusing understatement. With trips to Iowa and New Hampshire lined up in May, the Kentucky senator is diving in head first. Next up on his early state roadshow: South Carolina. He's also set to endorse Republican Mark Sanford in the special election in South Carolina's 1st Congressional District, two sources familiar with the race said. The endorsement could come as soon as Tuesday. Paul's political organization will donate money to the South Carolina Republican Party for its get-out-the-vote effort in Sanford's race against Democrat Elizabeth Colbert Busch, one source said. That election will be held on May 7. Paul's father, former Texas Rep. Ron Paul, was a conservative ally of Sanford's when the two served in the House together in the 1990s. Paul has no plans to campaign with Sanford in South Carolina. Instead, Paul will visit the state on June 28. On his agenda are a lunch in Greenville and a barbecue dinner in Columbia, both designed to raise money for the South Carolina Republican Party. But the libertarian-leaning Paul isn't just targeting rank-and-file Republican voters: he's also organizing a pair of "invitation-only liberty events" to court the conservative activists who were loyal to his father's two presidential campaigns – the same activists who have been a thorn in the side of the state's GOP establishment for years. 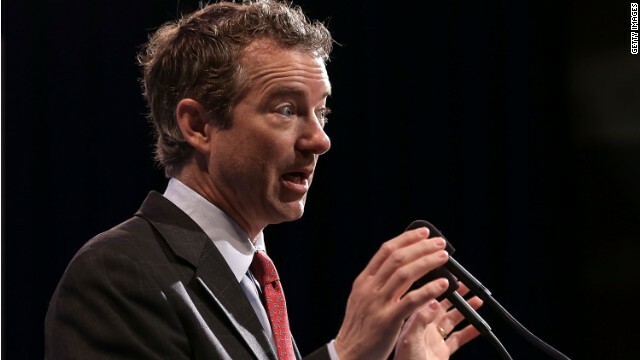 Since his 2010 Senate race, Paul has positioned himself as a libertarian who can be more palatable to the Republican mainstream than his father, but he has chafed some libertarian activists in the process. Paul's trip will come on the heels of another South Carolina appearance tinged with 2016 implications: Texas Sen. Ted Cruz is headlining a major fundraiser for the South Carolina GOP in May. Wasn't April Fools a few weeks ago? Rand Paul is delusional. Rand Paul is destined to beat his father's failed Whitehouse presidential bids because he's starting out younger than his father did. This liar will say anything you want him to say and then deny saying it regardless if it's recorded because he will blame right or left wingers for conspiring against him. If South Carolina succeeds from the Union then I can see this character being President of his own state..but failing to even know when not to fillibuster himself. The trouble is since the people of Kentucky elected this fool, the country is stuck with him for another 4 yrs. Rand Paul earned my vote a long time ago. I will not hesitate for a second to put Rand Paul in the POTUS office. "... Unless and until 'Murikans decide to get rid of their addiction to tax cuts and trickle-down fairy tales, we're going to end up with POTUSes like Dubya who enact policies designed specifically to "starve the beast" and force reliance on idiotic randian daydreams of society working best if everyone just runs around myopically acting in their own narrow self-interests." Rand Paul has that wasteland vision for our country. To all of you in love with Mr. Paul, go live as an "average person" in a developing nation where the top 1% own and control everything – then report back to us how grand it truly is. I lived in Panama growing up and unless you happened to be lucky enough to be born into that 1%, your life was scheisse. Evangelicals, Libertarians and Moderates (I think there are a few left)! What a laugh. Pee Wee Herman has more of a chance of becoming president than this goofball ever does. He doesn't realize that his ideas are for an ideal world which this isn't. I hope that he understands that and knows that he will fail. This is one state republicans will never have to work for. The ignorance, bigotry and hate is always there, just waiting for them to tap into it. Laying groundwork? Hahahahaha! I think it's more like he's laying coil..stinky coil. This rand is a bit, fine a LOT out of touch, because you can't change who and what you are. If it was up to him Blacks would still be drinking from their own fountains and only eating in their own restaurants. Never mind women having any rights because they can get beaten up by burly men and it's okay in his eyes. He's got the same chance as anyone else who will be running for president, which is 50/50. I'm giving the guy some credit. He will pull off a Akins move anytime . Endorsing Sanford should do it. Only in the desperate Guns Over People tea potty. When will CNN stop trying to paint Rand as a 'libertarian", he has said many times he is not, he is a Republican. He is the Republican Senator from Kentucky....much like his father was the Republican Congressman from Texas...it would seem that the media is trying to paint him as an outsider in an attempt to scare mainstream voters who would otherwise vote for him. The media thinks that throwing the libertarian word around will scare people....this is the dumbest scare tactic I have seen....come up with something better. I happen to think Rand and his father are great Republicans, if you define them from an older more traditional standard, say , Russel Kirk, or Robert Taft aka Mr Republican...or Barry Goldwater. Are they little George W's.....NO, but that's the point...George W and the like were not authentic Republicans...they were Neocons..or better said..progressives who stealthily infiltrated the Republican party in an attempt to move it left over a long period of time. if u want advice from me rand, stay in Kentucky & buy some of that good 'ol Kentucky bourbon, & "hang out" with 'ol mitch rand. To all the Ronbots looking to capture their non-existent Presidential glories – If you are pinning your hopes on this prime example of cluelessness to feed your aspirations for Presidency, as they say in Jersey, "Fuggeddaboudit!" This guy has as much chance of capturing the Republican nomination for President as George W. Bush has of being named the next Roman Catholic Pope. Paul would do a much better job than the current occupant of the white house. This country would then be headed in the right direction to be a great nation, instead of the nanny state/socialist direction it is headed in now. Unless we get somebody like him in the white house this country will fail all the faster. who cares both the democratic and republican parties are filled with career liars who steal from the american public via tax dollars and then lie about it. both parties are to blame for the shape this country is in and it's our (we the people ) fault for allowing them to do so. we need real candidates everyday americans.